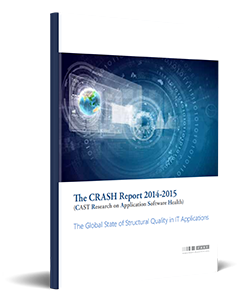 This is the third report produced by CAST on global trends in the structural quality of business application software. Structural quality refers to the engineering soundness of the architecture and coding of an application, rather than to the correctness with which it implements the customer’s functional requirements. These reports highlight trends in five structural quality characteristics—Robustness, Performance, Security, Changeability, and Transferability. The data in this report are drawn from the Appmarq benchmarking repository maintained by CAST. The sample in this report consists of 1316 applications submitted by 212 organizations in 12 industry sectors primarily in the United States, Europe, and India. These applications totaled approximately 706 million lines of code.